The launch of Midleton Very Rare 2017 marks the 34th annual release in a series that began in 1984. Over that time, the expression touted as ‘the pinnacle of Irish whiskey’ has evolved in line with the stocks from which it is drawn. Richard Woodard reports, with selected tasting notes by Dave Broom and Richard Woodard. In the cask-filled gloom of a Midleton warehouse, master distiller emeritus Barry Crockett is recalling the inaugural tasting of Midleton Very Rare 1984, the first in a line of 34 (so far) annual releases of the blended Irish whiskey. ‘It was launched in one of the new warehouses the year after, in November 1985,’ he remembers. ‘It was an appalling day – pouring with rain. I remember the Minister of Industry and Commerce, a man called John Bruton who later became Taoiseach, was there. 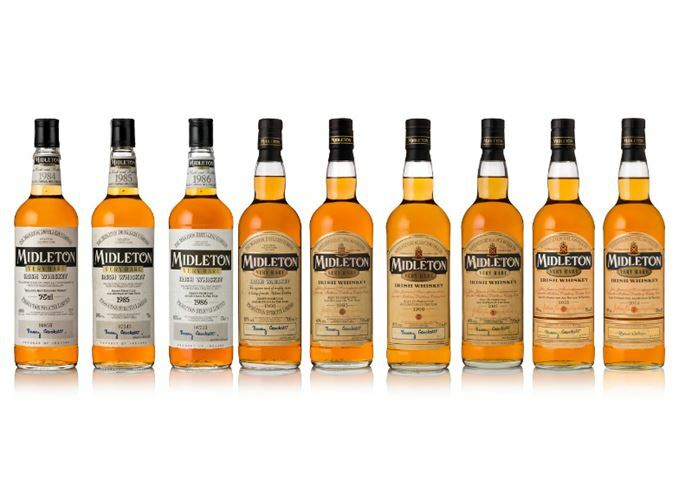 Midleton Very Rare was always billed as the best of the best – ‘the pinnacle of Irish whiskey’, as current Irish Distillers boss Jean-Christophe Coutures describes it – but the whiskey has undergone a considerable evolution over the past 33 years. At first, the choice of casks was limited – only 32 in the case of 1984 – and the age range was similarly restricted, spanning roughly nine to 13 years for the early releases, a reflection of the the relative youth of the New Midleton Distillery, commissioned in 1974. External factors, such as the economic downturn of the early 1990s, also impacted stock availability. As the series progressed, the choice of casks expanded to about 100, and the age of the grain and single pot still whiskeys increased too. The most mature whiskeys were 24 years old by the time of Crockett’s last Midleton Very Rare before retirement, in 2013. This year’s edition, the fourth created by Crockett’s successor as master distiller, Brian Nation, uses the oldest whiskeys in the series to date, including 32-year-old grain and 26-year-old single pot still. The youngest spirit in Midleton Very Rare 2017 is 12 years old (although the whiskey still bears no age statement). Spotting and explaining these variations is an obvious focus for anyone who collects annual releases, but Crockett is also keen to emphasise the common thread that unites 1984 with 2017 and all the years in between. He counts out four aspects: the ingredients; the distillation methods; the cask type; and the factor of age. He describes three principal flavour characteristics: honey, toasted wood and vanilla, underpinned by a distinct character of single pot still whiskey identified for Very Rare many years ago. The barley brings that green apple note; the grain (maize) a light, fragrant sweetness; the casks are typically first-fill American oak barrels, the source of the vanilla, the toastiness and, in tandem with the distillate, a creamy, honeyed character. These factors and flavours provide the central theme behind Midleton Very Rare’s many variations over the past three decades and more. Much has changed in that time period – from the age of the whiskeys to the new, swanky packaging and the man in charge of the liquid – but this connection with the past remains vital and strong. Some old bottle notes. Gentle, with dried soft fruits, brown banana and nutmeg. There’s some faded flowers and discreet oak. The palate moves into nutmeg to start with, then a soft, sweet and creamy mid-palate with that floral touch, before some peppery apple notes at the end (Dave Broom). Surprisingly strong, oily, pot still influence. Resinous and supple, with crème brûlée notes from the cask. Ripe banana and blackcurrant, plus some toasted sourdough with whipped butter and grape jelly. In time it’s all toffee and honey. The palate is fruity and silky with the spiciness of single pot still driving through, adding touches of cardamon on the finish (DB). Heavy toffee on the nose, with vanilla and some touches of new book. Some flashes of green grape and floral notes are suggestive of the grain element, as is the more perfumed lift. Plenty of subtle pot still underneath. The palate is amazingly sweet: all Demerara sugar and butter with some clove and cinnamon (DB).